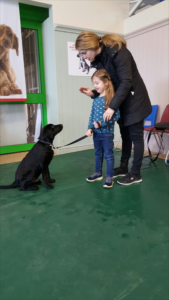 If you are unable to attend our group puppy school classes due to lack of time, spaces or personal reasons you may like to consider our one to one puppy school course which can take place at in your own home. or a mutually agreed location, at your convenience. These courses cover the comprehensive puppy school curriculum on an individual basis. We are also able to focus on any puppy problems you are experiencing and we can tailor the course to cover your needs. Our one to one puppy school course consists of four sessions, each being an hour long and costs £40 per session.